The Volvo Your Concept Car, known as the Volvo YCC, was unveiled at the Geneva Motor Show in 2004. It was designed entirely by women. It was so practical and perfect that we’re only just catching up with its low maintenance/low hassle transportation idea today. The car was ostensibly designed with the needs of female drivers in mind, but the car’s innovations would make owning and operating a car easier for anyone. Take the windshield wiper fluid intake, right next to the gas filling point, on the outside of the car. Who honestly relishes opening the hood and getting your hands dirty just to refill your wiper fluid? No one, I would humbly submit. Note that these are both capless, as well. The YCC had its beginnings in late 2001, after Marti Barletta, a consultant, did a series of workshops at the company and observed, “If you meet the expectations of women, you exceed the expectations of men.” Which is true, because men are useless slobs. 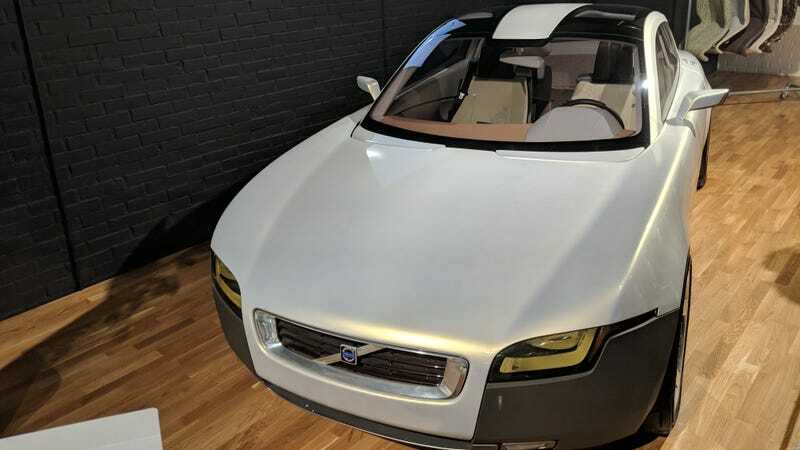 The car they ended up designing put an emphasis on visibility, storage, personalization, minimal maintenance, and ease of parking. You couldn’t even open the dang hood, for example, because the car had no hood, because it was designed to not need much maintenance, with an engine going 31,000 miles between oil changes. And the car was painted with dirt-resistant paint, so you wouldn’t have to wash it as often, along with run-flat tires, so you wouldn’t have to change your tire on the side of the road like a chump. On the inside, the designers took out the handbrake and gear shifter in the center console for more storage. A wastepaper basket! Those should’ve been standard in cars decades ago! The car also had gullwing doors to make it easier to enter and exit, and the rear seats collapsed to increase storage space, only opening if you need them, like seats at the movie theater. Your whole body is scanned at the dealership, then the data on your relative proportions (height, leg length, arm length) is used to define a driving position just for you. This is stored in digital form on your personal key unit. Once you get into the driver’s seat and dock your key on the centre console, the seat, steering wheel, pedals, head restraint and seat belt will all be adjusted automatically to suit your build. The result is a recommended fully personalised driving position with the best line of vision for you. While you’re sitting in the front seat, you’ll have a good view of the instrument panel, which doesn’t include a tachometer, temperature gauge, oil pressure gauge, or even fuel gauge, because why do you need all that nonsense? Instead, you’ve got a speedometer, a range indicator, and a navigation system. Perfect. One feature the car had that has become common is a parallel parking assist, in which the car would steer you into the spot while you control the throttle and brakes. What’s under the (non-existent) hood, if you must know? An inline five-cylinder engine making 215 horsepower, which is not the correct amount of horsepower, but certainly enough horsepower.